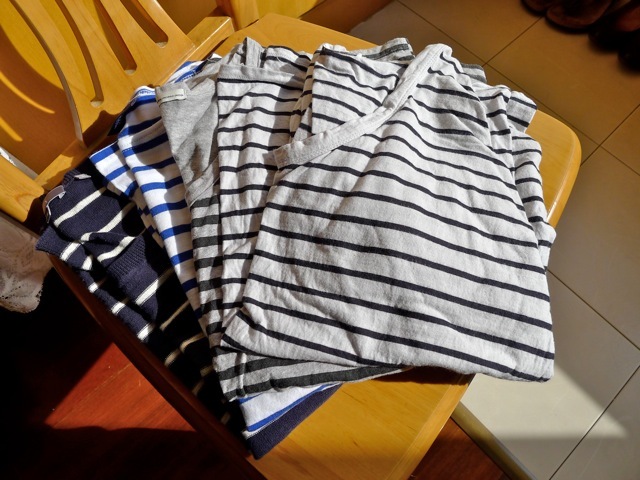 my breton striped shirts have made living out of my very limited abroad-wardrobe a breeze. i did a short post on this last year, but now that i've thoroughly road-tested my Saint James shirts that i purchased shortly before leaving for SH, an updated post is in order. quality-wise, my Saint James breton shirts are still my favorite and have held up superbly after about 7 months of (really) heavy-duty wash and wear. the laundry machine in my apartment literally puts my clothes through the ringer, and since i don't have a dryer, the only method is line-dry. alas, this has stretched out and bore some holes into some of my more delicate cotton shirts. for instance, some threads are already loose on my softer HOPE striped shirt. however, my 2 Saint James shirts have kept their shape perfectly well, and there has been no pilling, color-loss, or loose threads. very gratifying to see that this historic company is still making a really quality shirt! i love the pink and navy/pink stripe ones especially - the green is also such a cheery color for spring. and of course, the navy/cream is the original, timeless classic. size/fit/material: my Saint James shirts are made in France of a really nice 100% combed cotton that has a jersey-like handfeel (not too thick or stiff, not a knit, not too thin). another sign of a quality shirt: the stripes are woven, not printed. mine are in XS and they're straight through the torso, and just slouchy enough. i don't like them to be too fitted, and i like to wear them with the sleeves rolled up a bit. I adore the Breton striped shirt, although I have *maybe* one (if it can be called that). I meant to look more seriously at them in Paris, but time got away from me. Perhaps J Crew is the answer!! You look fabulous in them, as always. And if they can survive such horrors of washing machines, WOW! thanks Catherine! i was really happy when i saw that jcrew started carriny Saint James. and yes, take it from me, if my SJ bretons have withstood over half a year of Chinese laundry machine washing, they're the real deal! I always get a little excited when I see a new Foundations post from you! I love breton tops, they're just so easy to wear. I had to go through a few trials and errors before finding one that fit me properly. It's still not perfect but at least it looks good. I was always under the impression that the St James breton tops were a little stiff and never really looked into them. Glad to hear they're actually very soft! The particular Minquiers style you have wouldn't suit me though: straight and with shoulder seams a little past the shoulder, I'll look wider due to my body type! I'm hoping they have different styles so I can invest in one. yeah all my bretons are softer cotton ones - i don't like the very stiff cardboardy knit ones. those would be good for actual fishing on the rough seas! I love these, and currently own two - a 3/4 sleeve black/white with a shorter torso (can't remember the style name!) and then a Minquiers 10 in red/navy blue. I love both but I particularly love the red/navy blue...I would highly recommend it. I, too, am constantly searching for comfortable cotton that doesn't look terrible after a couple washes and you're right - Saint James is the key! So worth the price and possibly the best item in my wardrobe - glad you're enjoying yours! That first grey and black v-neck from the left is TDF! Who makes that one, if you don't mind me asking? I love this classic look. Thanks for sharing! La Marinière is indeed addictive. I remember spending HOURS making my collage of my favorite images from it for my own blog. That was fun. I have yet to splurge on a St. James. My current favorites are two I got from Gap, one in classic white and blue, the other in blue and red. It's made of a heavy knit, though, so they haven't gotten much wear because we are in the midst of a VERY hot summer. I also like the first one I've owned, and it's from H&M, made of light cotton in grey and black. It's held its shape well, and is in surprisingly in good shape considering (1) how much I've worn it and (2) it's from H&M. i know - such an endless inspiration stream! i have a few H&M cotton basics that are quite well made. i believe mine are organic cotton too! I'm so curious about Saint James because everyone seems to have nothing but good things to say about them. Definitely a contender if my own Bretons need replacing. I was happy with two Bretons for quite a long time, and added a third last year. I don't need too many to make me happy! Personally I do like them in the stiffer knits because I like a more sturdy look to set it apart from the t-shirt feel. Which means I only wear mine on cooler days. Beautiful, Miss Sophie! Can you tell if the J.Crew St. James and the original are of the same quality and hand? I have not been very impressed by J.Crew's quality; however, I was planning on purchasing a breton from St. James anyways, and the slimmer fit would probably fit me better (I am petite, with narrow shoulders). Thanks! I bought the navy and pink one. I'll see how it fits, and if it's a winner I'll probably buy another. You make puffer jackets look so cool. Plus cute pilgrim shoes too. I got into striped tees a few years ago. They're more interesting than solids for a layer-er like me. I have 4 striped tees so far: 2 navy/whites, cream/lt. blue, and a grey/white stripe that started it all. I wouldn't mind a black with white stripes one but it's no priority. hah, that photo was from the middle of winter so it was all about utility! :) i totally agree; a stripe is IDEAL for layering and adding visual interest to a look! Hi, I bought my first one last year, Armor Lux, 3/4 sleeves, 5 colours strips (orange, yellow, red green, and brown ). I also have a non original breton one, orange and olive green. I like them, and maybe I will buy the one I saw yesterday in the Armor Lux shop: a classic navy one, 3/4 sleeve with a lace yoke. I wear one from Target - they are a tad young for me so qualify as a trend, not as foundation:). still a classic in my book ;) - Picasso wore them as well as so many icons from the 60s and 70s! Hi, I love the way you style these. I had an interesting experience shopping at SJ in Paris with my sister. She was surprised when I dragged her there because the shop looks really... "normal" from the outside (nothing screams "buy me buy me"). But like you said, it has that family business vibe inside, and the fitting room is very cute, very nautical. The funny thing is that there were only old ladies and I looked completely out of place haha. Anyway, I just bought my very first SJ marinière in January and have been wearing it every week ever since. It's the Huitrière II (3/4 sleeves, navy/cream, jersey, with shorter, more fitted torso). At first, I kinda hesitated between this and the Minquiers 10, but considering I don't have enough of thick, warm shirts for the cold European weather (I just moved to Paris to study from sunny tropical Viet Nam), I went ahead and splurged on the Huitrière II and am very glad I did. It's thinner than the men's version, and I don't think it would be too hot to wear in the summer. I prefer it not tucked in pants but it looks good either ways. You might want to consider going one size up (I went 2) if you're buying SJ women's marinière, for a loose fit. I'm thinking about getting the Levant 10, the short sleeved version of the Minquiers 10, in red/cream. i prefer the men's/unisex bretons still because i can get the smallest size and its got just enough slouch. i had a women's breton before and it came a little short in the torso. 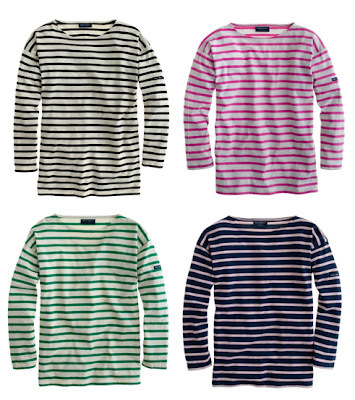 i do love the slimmer sleeves on the SJ ones currently at jcrew though. Like everyone else I'm a definite fan of the breton stripe! I currently have four- my favorite being the one from Saint James. I have a kids one and the length is perfect. So much so that I'm thinking of getting another in the navy w/white stripes color combo. btw, my PS1 is holding up awesomely (and it has been in the rain)! no obvious water marks (i just rubbed at it til it faded into the leather! ugh I totally bought the wrong one! I have the Naval II and its so stiff and boxy, kind of a masculine cut almost. Desperately want to buy a Saint James - have since I was in Paris last year - but will have to order online as I am currently living in Australia! All my internationally bought clothes are Euro 38 and US 8, but I am just so worried about sizing online. Also you look so much smaller than me in your photos!! Can you give any more sizing info/advice? I really like the navy/pink stripe brenton. I might have to order that one. Also, I've been reading for a while, but I haven't commented and I wanted to tell you that I love your blog! Just read your entire blog in one day.. I'm addicted to your simple, yet oerfect style. I NEED you make another post soon!! Hi, can you let me know what ballet flats are you wearing in the last picture? I like the higher cut of these! Hello! I love St. James and was so ecstatic when J. Crew began selling them! I have the white and marine Meridien and the Naval II in red, but I missed out on the pink and green Bretons you have above!!! And they are definitely not on the St. James website. Do you have ANY idea where I can find them?!? I am dying, DYING to have them!!! Someone help! Hi, I read your blog regularly a enjoy it a lot. I know this is an older post, but I had a question about the St. James shirts. I recently bought 2 from J Crew (the Meridien) and they both have pilling after only a few washes. It's not severe and I will probably just ignore it, but I am really disappointed as these are expensive shirts that should not do this. I wash them in the machine with cold water and hang them to dry, which is what the washing instructions say to do. I am not hard on these shirts at all. I am wondering what you think of this -- you say yours have not pilled so I am wondering what I might be doing wrong! Or if the shirts have just lowered in quality lately or something. Thanks!